I air kiss my wife as she drops me at the Ft. Myers airport at noon. We don’t actually lock lips because, as of a few hours ago, I was still having rumblings from the stomach flu. I’ve been suffering through it for the last two days, my second bout in as many months. God-awful. I am headed to Missouri where, Thursday morning, I will take my mother to the hospital. She is having elective surgery that, if she weren’t 102, would be considered routine. The doctor assures us her odds are excellent. I head to Avis to pick up my car, which turns out to be a big red Lincoln. Crazy, but I’m driving the 1,200 miles to Missouri. The reason I am driving instead of flying is that I want to pass through Alabama en route to the Show-Me state. I’ve been to Africa four times but never to Alabama. Go figure. I’ll fly back Monday if all goes well. I was originally planning on leaving around 8 a.m. to arrive in Missouri tomorrow (Tuesday) night but hadn’t counted on the flu and worry I might still be contagious when I get there and most certainly don’t want to infect mom. From what I’ve been able to find out online, there’s no likelihood I’ll still be contagious if I arrive Wednesday, a day later than planned. Thirty miles east of Tallahassee, I call home. My wife says a letter from the IRS has arrived and asks if I want her to open it. “Sure,” I tell her. “What have you done?” she demands. “I have no idea what this is about, ” I reply. I ask her to read it to me. She does. I ask her to read it again. She does. 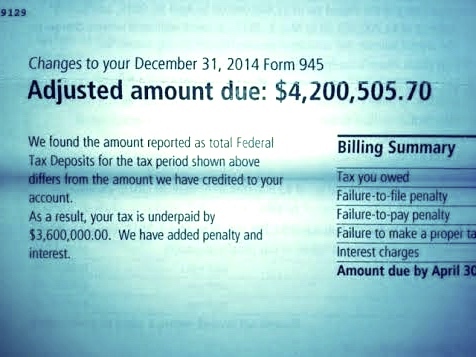 The letter, from the IRS’ Cincinnati office, is addressed to the Dryden Partners 401K Plan. Last summer, for the first time, I took money from the plan. I owed $36,000 in taxes on that withdrawal. All the details -- the withdrawal and tax payment, which was made on time -- were handled by a Connecticut benefits company that, for 20 years, has been administering the plan. I had hoped to make Alabama tonight but not now. “I’m going to turn around. I’ll be home around midnight,” I tell my wife. Thirty minutes later I call from the front desk of a Holiday Inn and give my wife the hotel’s fax number. Five minutes later the letter arrives. I read, re-read, then read it again. It says I owe $3,600,000 plus penalties, interest and failure-to-file fees. I email Mary at the Benefits Company, telling her to look for the letter and to call me first thing in the morning. I sleep, at most, an hour because I’m running back and forth to the bathroom. My stomach bug has returned full force. In Podunk, Alabama, I stop at one of those pack and ship places that always have business centers. “Our printer is broken,” the clerk says. Two hours later, I stop at an office superstore near Birmingham. Their printer is broken, too. “You have 100 printers on your shelves, go get one out of a box,” I plead. “We cain’t do that,” the clerk explains. I throw up in the parking lot. My khakis, from the knees down, are covered with puke. I clean myself up the best I can then email Mary to tell her I’ll send it tonight from the hotel where I’m planning to stay in Tunica, Mississippi, a luxury high-rise, owned by a major casino operator. Around 8 p.m. I walk into the hotel lobby, which is grand. The patrons aren’t – big-bellied good ole boys in jeans and blue-haired women in polyester stretch pants. Even in my vomit-stained slacks, I’m probably the most distinguished-looking patron in the joint. I head to the concierge desk. The man behind it informs me the concierge only works weekends. I ask where the business center is, explaining I have a document I need to print out, sign and fax. “We ain’t got one,” he says. He tells me to inquire at the front desk. The clerk there says the manager can handle it, but she’s not around -- she should be back momentarily. An hour later, I’m back at the front desk. There was no call. “Oh, there she is,” the clerk announces, indicating a woman shuffling across the lobby. Ten minutes later, I’ve signed the POA and given the clerk the fax number of the Benefits Company. “I want a printout showing it went through,” I tell her. “No problem,” she smiles as she disappears into the manager’s office. She brings me the document and a sheet showing it was received at the other end. I slip her $20, then return to my room where I am sick all night, but at least I sleep some. My stomach, by now, is empty so there’s nothing to come out. As I'm crossing into Missouri, I get an email from Mary. She says they received three blank pages overnight. The idiot clerk in Mississippi faxed the POA upside-down. I tell her I am desperate. She says there’s a truck stop 50 miles up the road, in Hayti, that has a public fax. I hightail it up I-55. An hour later, the signed POA is in Mary’s hands. I am sure because I call her to confirm it. In Ste. Genevieve I stop at a Dairy Queen and order a Blizzard, the first food I’ve had since I left home two days ago. My mother is asleep when I arrive around 4 p.m. Checking email, I’m relieved to see Mary has written that her office spoke with the IRS and pointed out the mistake which they seem to understand. 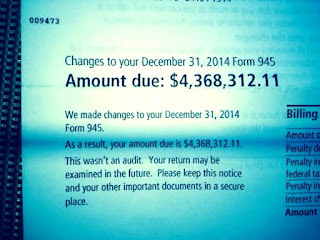 She says the IRS has promised I’ll get a letter within 30 to 45 days acknowledging the mix-up and assures they no longer expect me to pay the $4.2 million and change by the end of the month. I eat a huge dinner. I pick my mom up at 6 a.m. and take her to the hospital where we are met by my sister and nephew. They live in Missouri. They could have taken her but I volunteered to come up and do it – too much of mom’s care has fallen on their shoulders over the years. I am not working, have the free time and want to be there as much for them as for mom. By 10 a.m. mom is in the recovery room. She says she was conscious the whole time and watched her angioplasty procedure on the video monitor. She says it was fascinating. The doctor says she did great, but that he’ll keep her in the hospital overnight. My sister and her son depart. She is going home, across town. He’s headed back to his office near Kansas City. Around 3 that afternoon, as mom is sleeping, I call my sister. She warns me not to get upset but she is in the town’s other hospital. She is having symptoms of a heart attack. I rush over there, sit with her a while in the E.R. and call her son to let him know what is happening. I then hurry back to mom’s bedside. She asks where I’ve been. "I took a walk," I lie. When I leave at 7:30, mom is watching Martha Stewart on TV. “She looks like she’s had some work,” mom says, commenting on Martha’s unnaturally unlined face. I kiss the top of her head and rush cross town to the hospital where my sister is being kept overnight and stay with her until 9. I call my sister first thing. She says she’s fine. It wasn’t a heart attack, the doctors are being overly cautious. She will be dismissed around noon. So I head to mom’s hospital. The moment I walk in it is clear something has gone wrong, and her condition deteriorates as the day progresses. My sister comes at mid-day, straight from her hospital. By the time my nephew and his fiancé arrive late that afternoon, I know in my heart that we’re going to lose her. When he leans down to kiss his grandmother, there is no recognition for the grandson she has always doted upon. My sister and I leave at 10 p.m. My nephew and his fiancé are spending the night in mom’s room. My mother dies at 7 a.m. I call the airline and cancel tomorrow's reservation, then call Avis and extend the car rental through Thursday by talking to a computer, not a live agent. Strange. The next few days are a blur of burial arrangements, cleaning out mom’s apartment, going through her things, making plans for the memorial service. My brother and sister-in-law have arrived from Ohio. Yes, mom was 102 but we’re all in shock. We didn’t expect this. I drive 120 miles to the St. Louis airport and drop the car at Avis. The agent says he can’t give me a receipt, his printer is broken – a theme I’ve heard often over the last few days. He says he will email it to me. Back in Florida that night, as I am about to turn in, I check my email. No receipt. I go online to avis.com where I have an account. It says it can’t provide a receipt because I first have to return the car. It occurs to me I may well have been scammed. Perhaps the reason the agent couldn’t give me a receipt is that he wasn’t an Avis employee in the first place and couldn't produce one. Maybe he was an impostor, took the keys and drove the car off the lot and it’s in a chop shop somewhere and I’m on the hook for $40,000 or whatever it is a Lincoln costs. I call Avis’s 800 number. It’s impossible to reach a human. I call a special number reserved for elite renters like I used to be but no longer am. The agent laughs – actually laughs -- when I explain my concern. It’s almost midnight now. She says I have to call the St. Louis Avis office and gives me the number. I try for an hour but nobody picks up. I call the elite renter number again. A different agent gives me the manager’s number. I leave a message on her machine and wait half an hour but she doesn’t call back. I try the office number again. This time I reach someone who assures me things like this happen all the time and he will go out in the lot and look for the car and, if it’s there, will close out my contract and email the receipt. “Do it now,” I beg. “OK," he says. An hour later, having received nothing, I go to bed. Checking my email at 8 a.m., the receipt has arrived. Today’s mail contains the long-awaited letter from the IRS in Cincinnati. They have re-examined my case. 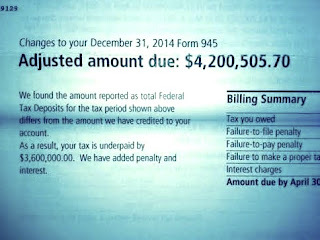 Instead of $4,200,505.70, I now owe $4,368,312.11, payable by June 5. They’ve added $176,400 in penalties and interest since last month. It’s the first day of a three-day weekend. The Benefits Company is closed. So is the IRS. There’s nothing I can do but stew and imagine IRS agents seizing my bank accounts and our house and cars and my wife and our dachshunds before hauling me off to jail, all because I didn’t pay millions I never owed in the first place. I send the letter to Mary at the Benefits Company then call her. She reiterates that someone in her office talked to the IRS last month and was assured the matter was taken care of. She says she will call again and asks me to be available so she can patch me in on a three-way call with the IRS. I stay home all day waiting for a call that doesn’t come. 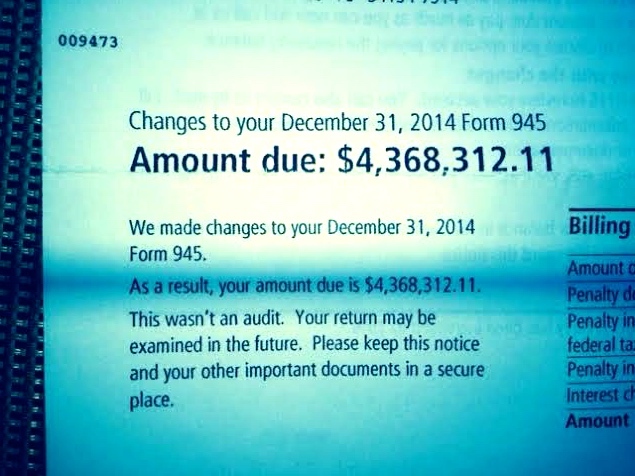 Another letter arrives from the IRS. This one is from Ogden, Utah. It thanks me for my "inquiry of April 22" and says they have “corrected your account based on the information you provided.” It bothers me the letter doesn’t acknowledge that I don’t owe them anything. End of story. I hope. Check back with me a month from now. The meaning of Thanksgiving, a day originally set aside for Americans to be grateful for what we have, has been forever perverted by retailers like Kmart, Best Buy and Macy’s who keep their doors open that day to lure in bargain-crazed shoppers hoping to buy discounted merchandise made in third-world countries they can give as gifts to people who will return it all the day after Christmas. Slowly, insidiously, those same retailers have, in recent years, been setting their marketing periscopes on what many consider to be an even more sacred day on our national calendar, Memorial Day. Virtually every retail chain in the country now runs Memorial Weekend sales that, naturally, offer extra discounts on the actual day set aside to honor our war dead. God forbid management miss out on the opportunity to rake in one incremental penny of profits. And God forbid Americans actually bow their heads in remembrance of those who died fighting for our freedom rather than spend that day fighting each other over the last pair of size XL stretch pants dangling from the rack at Wal-mart. It's disgusting and something that isn't confined to retailers at your local mall. I take particular umbrage with German and Japanese car manufacturers whose dealers are flooding the airwaves with commercials for Memorial Day sales “events.” (Pearl Harbor was an “event.” Toyota-thon isn’t.) I’m sure I sound like an old fogey, especially in light of a recent study that shows that nearly 40 percent of Americans have no idea who we fought in WWII, but if it weren’t for the German and Japanese carmakers whose factories cranked out tanks and airplanes during that war, Americans would have several hundred thousand fewer graves upon which to place foreign-made flags. While many – probably most – of those manufacturers now build a substantial percentage of their vehicles destined for American consumers here in the US of A (where labor is cheap – they may have lost the war but won the economic battle), the fact of the matter is the profits largely flow back to German and Japanese shareholders. I don’t know about you but, come Monday, I won’t be rushing to Sears, Dillard's or Target, or running out and buying a Honda or BMW because I've been promised discounted prices. Yes, I'll probably grill some burgers and might even spend part of the day at the beach or taking a long bike ride, but I'm also going to set aside some time, as every American should, to reflect on those who paid the ultimate price. Like this post? Please share it with your friends. Simply hit one of the buttons below. I woke up this Mother’s Day thinking about my mine, who died two weeks ago at 102. If you’re expecting a column about how this day is going to be painful, or how cruel it is to lose one’s mother just before Mother’s Day, you’re mistaken. How can I possibly feel sorry for myself when I had my mother for 63 years? That’s pretty darn good in anyone’s book. Hardly any friends my age still have their mothers and if they do, theirs certainly aren’t in the shape mine was. My brother and sister, who are sixteen and nine years older than I, were even luckier. My brother, Jerry, had his mother for 79 years. Several years ago I asked mom what Jerry had given her for Mothers Day. “He sent a beautiful arrangement of flowers with a note that says, ‘After 75 Mother’s Days I’m running out of gift ideas,’” she said, laughing. My siblings and I have known for years, as mom moved past elderly and into the realm of ancient, how lucky we were not only to have her but to have a mother who was still eager to learn new things, still looking to the future and who, as all good mothers do, loved us unconditionally. So while I’ve deleted without reading emails inviting me to order last minute gifts, and have shifted my brain into park when I see TV commercials for Mother’s Day, I am not dwelling on my loss. Mom wouldn’t want that. She went out on her own terms, exactly the way she wanted to. For one day out of the 37,322 she lived -- her final one -- she was sick, but she didn’t know it because she had suffered a stroke. 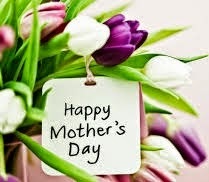 That’s something to celebrate this Mother’s Day -- that and having my mother for as long as I did. That's Bonnie on the left. You can see the two huge lipomas dangling from her belly. This picture is two years old and they've grown even larger. Two weeks ago yesterday I took my mother to the hospital for elective surgery. She was nervous about it. I wasn’t. I was sure she’d come through fine, and she did. But that night she suffered a stroke and within 24 hours she was gone. This morning I took our 14-year-old dachshund, Bonnie, to the veterinary hospital for elective surgery. Bonnie wasn't as nervous as she usually is when she goes to the vet. She, of course, had no idea what was going to happen. But I’m about to jump out of my skin. Bonnie for years has been afflicted with lipomas – fatty lumps that are almost always benign – that dangle from her underside, making it look like she’s about to give birth to a large litter of puppies. We used to have the lipomas removed as soon as they appeared until our vet explained they would almost certainly return and the surgeries were causing her needless pain. But this time, we’re going for it. Bonnie has two massive lipomas that drag on the ground, making it difficult to walk. They bleed. They itch. The vet says it’s a quality of life issue. So while it was our decision, we felt like we didn't really have a choice if we wanted her to enjoy whatever time she has left. I’ve watched youtube videos of lipoma surgery on dogs. The lumps, once removed, look like skinless chicken breasts. There’s a lot of blood, and multiple, lengthy incisions, but the dogs whose surgeries I’ve watched have survived and recovered. Those dogs, however, were younger. I haven’t found any information about the odds for a dog her age. There is no comparison between losing a human you love and an animal you love. I know that. I also know there are people who are undergoing real loss right now, people in pain, people who are hungry, people who have no hope. A 14-year-old dog isn't important in the scheme of things. But she is important to us so I'm a bundle of nerves right now. Didn’t sleep well. Can’t eat. Can’t do anything until that phone rings. I’m planning to sleep on the floor next to her bed for the next few nights to be there if she needs me. Because, even though she’s just a little dog who has already lived a long life, she is loved way, way out of proportion to her importance on this planet and it would be painful to lose her. Especially now. I'll let you know how things work out. 11:30 a.m.: The vet called. Bonnie made it through the surgery and he said he is pleased with how things went. There's a mini bottle of Champagne in the fridge, which we'll open once we bring her home this afternoon.